A few months back my friend Anne sent me an email and asked me if I would review her upcoming book of knitting patterns. I immediately said YES, not only because I know Anne but also because I knew (because I know Anne) just how awesome this book was bound to be. And I was right. Legendary Knits vol. 1 by Anne Podlesak is a terrific book of designs. There are patterns for several sweaters – including an awesome guy-sweater, some socks, a stole, a cowl, and a shawl that I’m having a difficult time not casting on right.this.minute. The directions are clear and precise without being overwhelming and the yarn choices include some of my favorites: Woolen Rabbit, Dream in Color, Wooly Wonka Fibers (Anne’s own company) and Berroco. The photographs are beautiful and show not only stylized shots but also the shots every knitter wants: shoulder seams, cuff details, neck edgings, lace motifs and more. Each pattern is accompanied by an explanation of the name chosen for the design inspiration, whether it be fairy tale, myth of legend. And, while those stories are often tragic, they make for great romantic names! Have I convinced you to run right out and get yourself a copy of this book? I hope I have but one of you won’t have to do that because Anne sent me a copy to give away! All you have to do to enter is leave me a comment with the name of your favorite fairy tale. The contest will be open until midnight (of course!) on Thursday, September 26, 2013. 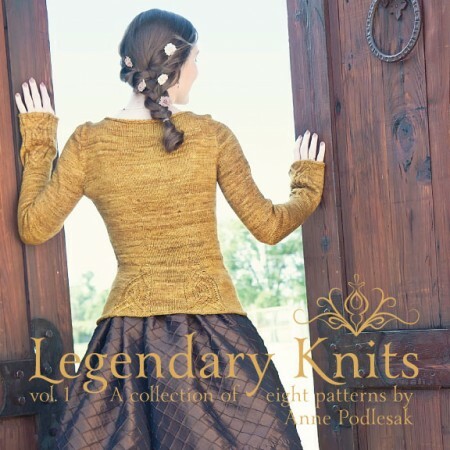 In the meantime I’ll be dreaming about knitting and princesses and legends! The book looks amazing! My favorite fairy tale is Sleeping Beauty. Thanks for the giveaway. Hmmmmm. Rumplestiltskin or rapunzel. Off to ravelry to check out the patterns although the sweater just on the cover is gorgeous and I would buy the book just for that! Beautiful patterns. Since I love starfish and everything from the sea my favorite tale is The Little Mermaid. I’ve always loved The Little Mermaid……Hans Christian Andersen version, not Disney! The book looks lovely….I’ll be looking for it. I would have to say my all time favorite is Little Red Riding Hood. Is that a fairy tale??? What a lovely and enchanting cover. It looks like a treasure, indeed! Happy weekend, Carole. I always loved Sleeping Beauty. I would love to win that book. Picking a favorite fairy tale is a choice between “The Six Swans” where knitting saves the day or “The Ugly Duckling” which gave hope that things would get better. The book looks very interesting – look forward to reading it! My favorite fairy tale is Cinderella! I loved it since I was a little girl! What a beautiful book! Hmm Little Mermaid, the HCAnderson version is kind of sad or “The Seven Swans” where the sister silently spins nettles for her brothers to break the evil spell. Well, my very favorite fairy tale is Rumpelstiltskin . . . More than the story, I love the memories of the special lady who read that to my brother and me many many times – your friend and mine, Carolyn B. I wish I had the book that she gave us! One of my favorite fairy tales is The Nightingale, by Hans Christian Andersen. I’d say my favorite fairy tale would have to be Rapplestilzkin… because of the knitting. Just kidding… probably Sleeping Beauty. Thank you for hosting! My favourite fairytale is the”Princess and the Pea”. The story is so compelling but the pictures that always go with it are so special. There is always the big stack of colourful quilts with the little green pea at the bottom. As though she could feel it,……BELIEVE!!! I think the HCA version of the little mermaid..congrats on your big news. Hard to choose–one of my favorites is The Elves and the Shoemaker. My favorite is Sleeping Beauty. Thanks – it looks like a great book! That looks like a fabulous book! I think my current favorite fairy tale is the Twelve Dancing Princesses – though mostly because of the fairy tale retellings I’ve read lately, that one was my favorite.